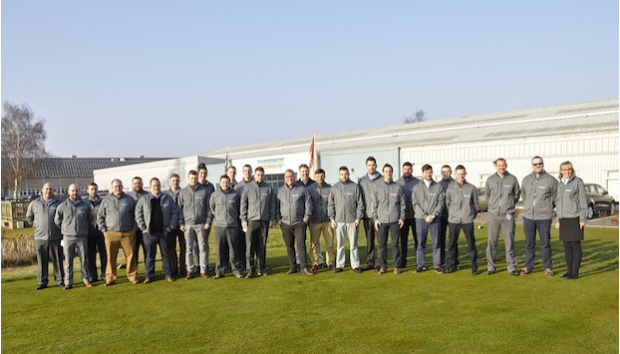 Performance really does matter for the 21 delegates who attended the fourth BIGGA Future Turf Managers’ Initiative (FTMI), made possible by Jacobsen, which took place recently at our European headquarters here in Ipswich. Since its inception in 2013, over 80 delegates have now graduated from the FTMI programme. Aimed at up and coming greenkeepers who are intent on making the career leap to Head Greenkeeper or Course Manager, the FTMI focuses on personal and professional development and utilises the expertise of respected course managers, cross-industry training specialists and industry experts to mentor and educate the next generation of industry leaders. Arriving at lunchtime on the first day, the group was welcomed by Alan Prickett, Ransomes Jacobsen’s Managing Director and Will Carr, UK & Ireland Golf Sales Manager, before being split into groups and touring the manufacturing facilities. The first day finished with a dinner at a local hotel, where Sami Strutt of BIGGA officially welcomed the delegates and introduced the mentors and host members of the Ransomes Jacobsen team. Renowned Golf Consultant Eddie Bullock, former PGA Captain and current non-executive Director of Golf at Goodwood, began the second day with a presentation on what it takes to become an effective leader. Break-out sessions with the mentors and delegates provided ample discussions on the points raised in the presentation. After lunch, Lorna Sheldon, a respected personal communication and presentation skills trainer, provided valuable insights into writing a CV, preparing for an interview and the techniques required when in front of an interview panel. The role play sessions provided the delegates with an opportunity to put their new learning into practice. 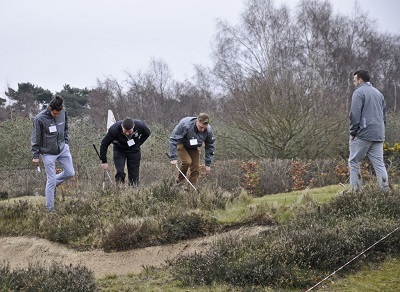 They returned to their hotel for dinner, after which one of the mentors, Steve Chappell, Head Greenkeeper at the PGA Centenary Course in Gleneagles, gave a presentation on the benefits of volunteering opportunities at major tournaments. The final day began with an intensive and highly informative interactive presentation by Lee Strutt, Golf Course Manager at Royal Automobile Club in Surrey, which provided an introduction to the golf course maintenance budget, the use of Excel spreadsheets and how to sell the budget to stakeholders. The mentors then took part in a humorous role play session, in which Matt Plested, Course Manager at Stoneham Golf Club requested funds to purchase a soil temperature meter from a belligerent greens committee. His knowledge of the budget and persuasive arguments about the benefits that this new tool could bring to the club finally won the day! If the delegates were expecting an easy end to the event after lunch, they were very much mistaken. Always the graveyard spot for any presenter, the final educator Michael Astrop, ensured that no one could relax as he launched into an energetic presentation on Crucial Conversations. This highly interactive presentation provided an opportunity for the team to first identify the need for a crucial conversation and provided the tools they would require to conduct themselves when faced with awkward situations in their new managerial roles. At one stage a puppet monkey was used to emphasise a point that he was making! It was left to Will Carr, Ransomes Jacobsen’s UK & Ireland Golf Sales Manager, to hand out certificates to the delegates and then close the event. He thanked everyone for their time and contribution to what was a hugely successful and worthwhile three days of first-class education. “FTMI is without doubt the single most important turning point in my career. With over twenty years of experience within the industry, this has been the first opportunity to get a real feel for the leadership role. Not only was the whole process inspiring, it was also thought provoking and confidence building. “The networking with similar, like-minded professionals within the industry has created a group of friends for life. The mentors, apart from being professionals to aspire to, were also incredibly modest and had the patience to answer all the questions asked of them. All of them were a complete credit to our industry. “BIGGA is immensely proud to play a key role in the development of its members through the Future Turf Managers Initiative made possible by our industry Partner, Jacobsen. The FTMI provides BIGGA members with the opportunity to immerse themselves in an intensive, inspiring and memorable learning experience. Engaging with colleagues with the same career aspirations reinforces that competition is fierce for management roles in the industry. Being part of the FTMI experience equips BIGGA members with the skills and knowledge for success.